Harvard Business Publishing was recognized among top providers of content and services in corporate learning and development for its on-demand, enterprise-wide solutions Harvard ManageMentor and Leading Edge. The company also provides a suite of blended programs that help companies across the globe elevate performance, accelerate pipelines, and transform their organizations. Different learning styles and different organizational needs require different approaches and formats. On-demand access is an approach that many of today’s busy learners are asking for and where our solutions Harvard ManageMentor and LeadingEdge shine. 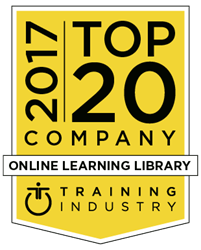 Harvard Business Publishing, developer of world-class leadership development solutions for global companies and organizations, announced today it has been named to TrainingIndustry.com’s first-ever Top 20 Online Learning Library Companies List. Developed as part of TrainingIndustry.com’s mission to continually monitor the training marketplace for the best providers of training services and technologies, the new ranking was created to aid organizations in identifying the best resources for high quality, on-demand learning content and solutions. Harvard Business Publishing Corporate Learning partners with clients to create world‐class leadership development solutions that help companies build a culture of learning throughout their organizations. Their on-demand, enterprise-wide solutions, Harvard ManageMentor® and LeadingEdge, were recognized on this list for showing tremendous quality and diversity in their offerings while also providing innovative features and analytics that meet the needs of modern learning and development. Harvard ManageMentor® combines the highest quality content with a unique design focused on putting learning into action. LeadingEdge gives leaders on-demand access to the best and latest business ideas to put into action and drive strategic initiatives. In addition to these award-winning solutions, Harvard Business Publishing offers clients a suite of strategic blended programs that help companies across the globe elevate performance, accelerate their pipelines, and transform their organizations to succeed in today’s complex business world. Through its level-based programs, organizational alignment solutions, and world-class design services, Harvard Business Publishing helps clients solve some of their organizations’ most pressing challenges by connecting them to ground-breaking thought leadership from Harvard Business School and Harvard Business Review, world-renowned educators, industry best practices, and a global community of practitioners to support and enhance their leadership development efforts.